A year ago, seasoned firefighter and emergency medical technician (EMT), Tim Breslin, was on call at Lincolnwood Engine 15 when he began to feel off. He had already responded to emergency calls that day, but told the chief he wasn’t feeling well and went to lie down. When the crew went to check on Tim, he was pale, sweaty and experiencing abdominal pain. 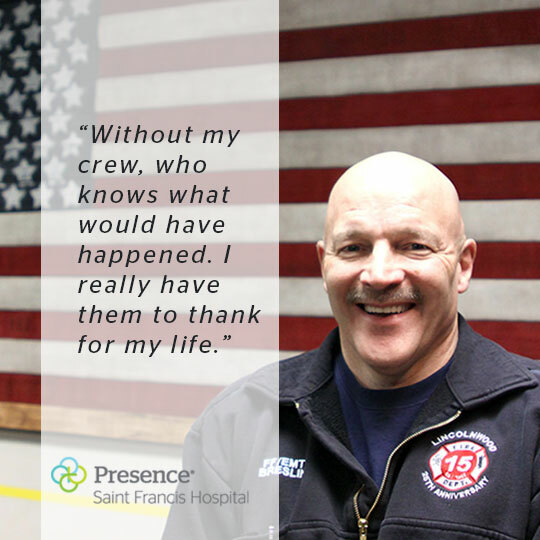 As emergency professionals, Tim and the crew knew something wasn’t right and his team rushed him to Presence Saint Francis Hospital, where members of the Lincolnwood Fire Department’s crew had done their paramedic and EMT training since 1977. Admitted into the ER, they soon learned that his odd symptoms were actually non-typical signs of a STEMI heart attack. Heart disease is the #1 killer of men and women in the U.S., resulting in one out of every four deaths. Heart attacks often strikes without notice. While chest pain is a one of the symptoms of a heart attack, like Tim, they can also present symptoms like body pains, nausea and heartburn among other symptoms. Tim was rushed into surgery where Presence Saint Francis Hospital’s expert team of doctors discovered a 90% blockage in his left coronary artery. Found just in time, he survived the heart attack and surgery with near no cardiac damage. “Presence Saint Francis Hospital is a community hospital, and proud to be an active member of the community. We value our long-standing relationship with the Lincolnwood Fire Department and was honored to help save the lives of one of our own partners’ lives,” says Sam Bagchi, MD, Interim President of Presence Saint Francis Hospital. Want to know your risk for heart disease? Take our free online assessment to learn your potential risk factors and get entered to win a FitBit Charge 2.